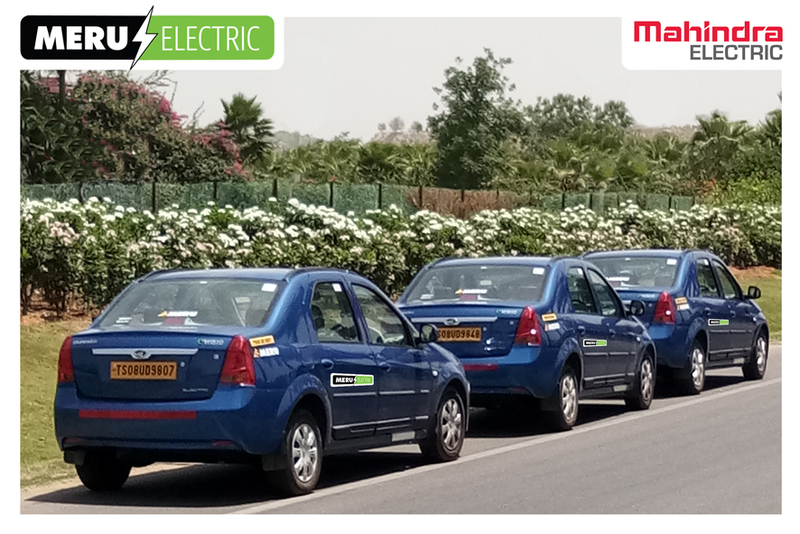 On the occasion of Earth Day, Mahindra Electric, part of the diversified US$19 billion Mahindra Group and Meru, the pioneer of tech enabled cab services, announced a collaboration for a pilot EV project in Hyderabad with the intention to replicate the same model in other cities soon. The pilot will see Meru deploy a fleet of eVeritos, the all-electric sedan by Mahindra. The Mahindra eVerito will be available for booking in Hyderabad through Meru’s mobile apps, website (www.meru.in), call center (4422-4422), and will also be available at the Meru Zone at Hyderabad Airport. The services will be available at the same fare as governed by the Telangana Government’s radio taxi fares for sedans. Mahindra Electric has been pioneering the EV movement in India for close to a decade, while Meru has been running their entire fleet on green fuel for the past 11 years in cities where CNG is available. Both organisations have been taking conscious steps towards environmentally friendly practices and this association is in sync with these philosophies. Meru pioneered the concept of tech enabled ride hailing service in India in 2007 in association with True North (formerly India Value Fund Advisors), a premier India centric private equity fund. Since its launch, Meru has served over twelve million customers in 24 cities. Meru service is available for travelling local and outstation destinations, both as point to point as well as hourly rental packages through its Android and iOS mobile apps with 5+ million downloads, website and call center. It is the only Government licensed cab service in India which is official partner of all the private airports in the country. Meru has received numerous accolades from the industry including India’s Most Favorite Cab Service and Best Cab App by TripAdvisor Traveler’s Choice for 2 consecutive years; Times Travel Award, NASSSCOM CNBC IT User Award for 3 consecutive years and Economic Time’s Most Promising Brands Award. Mahindra Electric, a part of the US$19 billion Mahindra Group is a global pioneer in the development and production of electric vehicles. Mahindra Electric is India’s only EV manufacturer with indigenously developed EV technologies that have won global accolades. The Mahindra Group has one of the most diversified portfolios of electric vehicles with the e2oPlus hatch, the eVerito sedan, the eSupro minivan and panel vans and its electric rickshaw, the e-Alfa Mini. Pushing the limits of technology and innovation, Mahindra has acknowledged the need to redefine mobility at every step. This has led to a vision with a desire to transform; a vision which provides an imagination which is more sustainable and more dependable. Venturing into the paradigm of alternative technology has helped Mahindra enable a clean, green and a smarter tomorrow. The Mahindra Group companies that enables people to rise through innovative mobility solutions, driving rural prosperity, enhancing urban living, nurturing new businesses and fostering communities. It has a leadership position in utility vehicles, information technology, financial services and vacation ownership in India and is the world’s largest tractor company, by volume. It also enjoys a strong presence in agribusiness, components, commercial vehicles, consulting services, energy, industrial equipment, logistics, real estate, steel, aerospace, defence and two wheelers. Headquartered in India, Mahindra employs over 200,000 people across 100 countries.